Updated: Thanks to all who participated in our successful history harvest at the Sheff 25th anniversary event on Saturday, April 26th, 2014. More than 30 participants granted oral history video interviews — far beyond our expectations — and brought photos & documents to scan. View oral history video interviews in the Trinity College section of the Connecticut Digital Archives. Join us for the 25th anniversary of the Sheff v. O’Neill struggle for quality integrated education on Saturday, April 26, 2014 from 8:30am-12:30pm at Starr Hall, UConn Law School, 110 Sherman Street, Hartford, CT. See flyer and RSVP here. We deeply appreciate CT Humanities for funding the history harvest portion of our event (see our proposal). Elizabeth Horton Sheff (born 1952) describes her experience as a parent plaintiff (on behalf of her son, Milo) in the Sheff v. O’Neill school desegregation lawsuit, originally filed in 1989. She recalls the early stage of her activism as a member of the Westbrook Village Tenants’ Association, working with the attorneys (such as John Brittain, Phil Tegeler), meeting other plaintiffs (such as the Bermudez, Leach, Connolly families), and connections with other activists. She discusses the legal process of the case as well as its long-term successes and limitations. Sheff also describes growing up in the Charter Oak housing project on Flatbush Avenue in Hartford, and the influence of the United Church of Christ on her life. 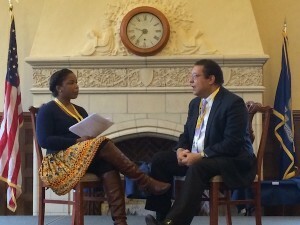 Wildaliz and Eva Bermudez (born 1982 and 1987, respectively) recall their earliest memories of activism for school integration in Greater Hartford through their involvement as young plaintiffs (with their brother, Pedro) in the 1989 Sheff v O’Neill lawsuit, and how the case shaped their lives as politically active adults today. The sisters describe why their parents (Pedro and Carmen Wilda Bermudez) supported the integration movement, and reflect on their personal experiences as Puerto Rican youth growing up in Hartford’s South End neighborhoods, attending Hartford Public Schools and bilingual education programs, and eventually (for Eva) an interdistrict magnet school. Karen and Leo Harrington (both born in 1949) recall their activism for school integration in Greater Hartford through their involvement in the 1989 Sheff v O’Neill lawsuit. Previously, in the early 1970s, they became active in housing discrimination testing with Boyd Hinds and the Education/Instruccion organization. They also describe their experiences as West End residents and parents of children in the Hartford Public Schools, followed by their decision to move to suburban West Hartford in the mid-1990s, and the sharp differences in educational quality and student expectations between the two districts. Eugene Leach (born 1944) recalls his activism to promote school integration in Greater Hartford with his involvement in the 1989 Sheff v O’Neill lawsuit, along with the lead plaintiffs Elizabeth Horton Sheff and Milo Sheff. He discusses his personal experience as a white suburban plaintiff parent during the case, his role as a Connecticut Civil Liberties Union board member, and public skepticism and political opposition he encountered. He reflects on the broader lessons of civil rights activism, which were influenced by his perspective as a professor of American Studies and history at Trinity College. Karen Taylor, History Harvest presentation at Sheff 25th anniversary, 2014, Hartford CT. The History Harvest Project at the University of Nebraska-Lincoln, co-directed by Will Thomas and Patrick Jones, http://historyharvest.unl.edu/. William G. Thomas, Patrick D. Jones, and Andrew Witmer, “History Harvests: What Happens When Students Collect and Digitize the People’s History?,” AHA Perspectives on History, January 2013, https://www.historians.org/publications-and-directories/perspectives-on-history/january-2013/history-harvests. Marc Parry, “‘History Harvest’ Project May Spawn a New Kind of MOOC,” The Chronicle of Higher Education, The Wired Campus, December 21, 2012, http://chronicle.com/blogs/wiredcampus/history-harvest-project-may-spawn-a-new-kind-of-mooc/41329. Jack Dougherty and Candace Simpson, “Who Owns Oral History? A Creative Commons Solution,” in Oral History in the Digital Age, ed. Doug Boyd et al. (Washington, DC: Institute of Library and Museum Services, 2012), http://ohda.matrix.msu.edu/2012/06/a-creative-commons-solution/.